Beware… today’s outfit screams summer! 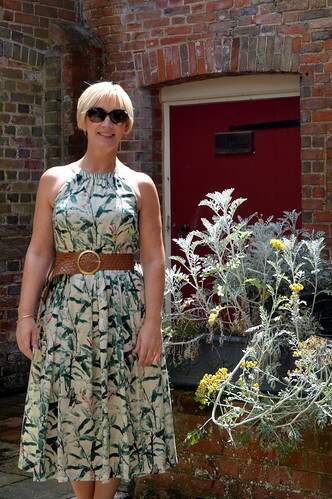 This lovely dress has got such a summery print with all the plants and flowers on it… let me show you how I styled it for a trip to Jane Austen country! I bought this dress at Ly-Lou, a shop which specializes in retro clothing (although this dress is not particularly retro) and was helped by the very friendly and honest shop owner, Kelly. 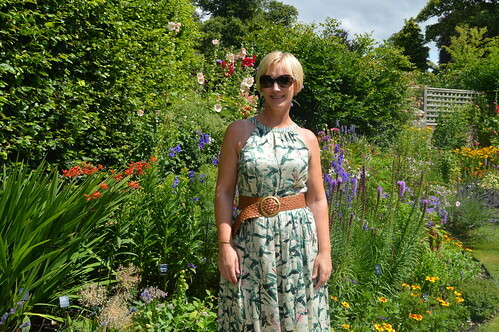 The dress is from the Irish brand Avoca Anthology. I was immediately drawn towards this dress for several reasons. First of all of course for the print. I just love the bold leaves print! Second of all, the shape of the dress as I instantly knew it would be perfect for my body type. And third of all the neckline! I know these kinds of necklines look good on my as you can see in this outfitpost and in this one. When I tried on the dress I felt so comfortable in it 🙂 So how to style it?! For my trip to Chawton (the village where Jane Austen spent her final, but most productive years… but more on that in a later travelpost!!!) I wore this dress with my denim jacket and a soft pink scarf. The dress is quite classic, but the jacket makes it a bit younger in my opinion. Lucky for me, the weather was so nice I could take off the jacket and scarf most of the time! I also added a belt and as we walked for hours on end that day, I opted for my comfy wedge sandals from Gabor. My giant tote (from H&M) could hold all the necessities for a day out and as the sun was out regularly, I wore my Dior sunglasses (which I bought at least 8 years ago, but I still like them!!). Do you like this dress? Any tips on how to style it otherwise? Let me know in the comments! 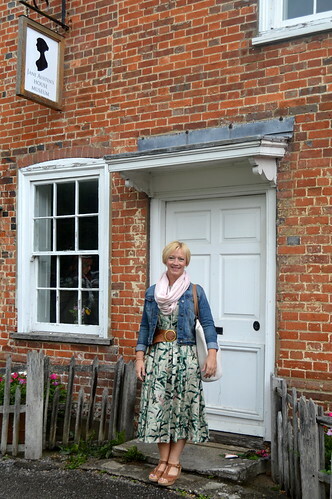 PS: More about Chawton in next Thursday’s travelpost!! This entry was posted in Fashion, Outfits, Summer and tagged Avoca Anthology, Fashion, gabor. I love that dress! I liked the styling with the jacket and scarf too. I love neckline. In need of the same dress honestly! I really love the neckline! I could imagine this would look good with the “audrey hepburn” straight across cut too! Beautiful pattern. Thats such a pretty dress, I love the colours. The location looks amazing too! The dress is beautiful, and looks so flattering! I love bold prints! Thanks Ann 🙂 Have a wonderful Sunday! !